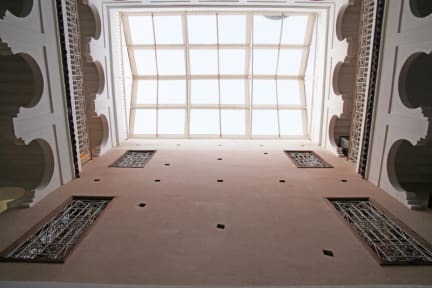 Monriad i Marrakech, Marokko: Reservér nu! Located in the heart of Marrakech, Monriad is a typical Moroccan house. The guesthouse maintains the traditional architecture and design of the typical Moroccan house. The house is divided on two floors, which overlook the patio, where there is a small pool and a lounge where you will have breakfast and dinner. The property has a living room with a fireplace and satellite TV. 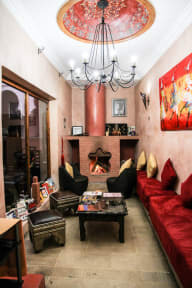 The guesthouse is very well-located in the historic quarter of the city, a 5 minute walk from main square Jamal El Fna and a few steps away from Bahia Palace. Monriad offers 11 rooms, all well-decorated. All rooms have private bathroom with shower, heating / air conditioning. Payment types accepted at this property: cash and credit card. Please note: the property may pre-authorize your card before arrival.